RO vs UV vs UF vs MF - Difference Between Water Purifier Technologies! Planning to buy a new water purifier for your home? Confused between all the technical terms? Most brands suffer from ‘I am the best’ syndrome and they focus more on marketing than providing actionable information. This has given birth to all the confusion that you have in your mind right now. Now that you have done all the hard work of landing on this page, let us do the rest. This post will explain the difference between RO, UV, UF and MF in simple terms. Choosing the right water purifier for your home is extremely important in order to ensure good health. And the first step in choosing the right purifier is understanding the quality of water and selecting the suitable water purification technology. We’ve already covered a detailed guide on how to choose the right water purifier for your home. In this previous post, we’ve covered detailed information on identifying commonly found impurities in water and mapping the right water purification technologies according to the water quality. This post will try to explain all the common water purification technologies like RO (Reverse Osmosis, UV (Ultraviolet), UF (Ultra Filtration) and MF (Micro Filtration), and the difference between them. Knowing the difference between the RO, UV, UF and MF water purification technologies will further help you in choosing the best water purifier that is most suitable for your home or office. Another popular terminology used with water purifiers is TDS, you can learn all about the TDS level of water in our previous post. Filters out all the suspended and visible impurities like mud, rust, dirt, sand etc. No filtering Filters out all the suspended and visible impurities like mud, rust, dirt, sand etc. Filters out all the suspended and visible impurities like mud, rust, dirt, sand etc. The below image visually depicts the filtration/purification characteristics and capabilities of MF, UF and RO membrane. Looking at the image above, one would naturally think, if RO alone can remove all impurities then what is the need of other purification methods like UV, UF and MF? We will get to this in a second. 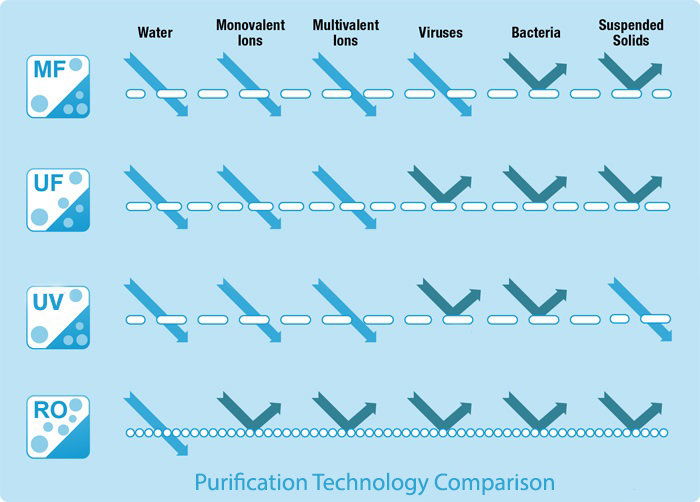 If you look at the comparison of purification technologies above, none of the UV, UF, MF offer complete protection against all commonly found impurities. So, it is quite clear that none of these three purification technologies can alone provide trustworthy purification. Now, coming back to the RO purification. The pores of the RO membrane are extremely small (0.0001 micron) and RO membrane is prone to damage and choking if appropriate pre-filtration is not used. This is why you see most RO purifiers using 2-4 pre-filters like pre-sediment filter, sediment filter, Pre Carbon Filter etc. RO water purifiers also need appropriate post-treatment like UV column, post-carbon filter and mineralizer etc. All these post RO filtrations and water treatment are usually added to be 100% sure of the purification and to remove any organic and inorganic impurities still left in the water. RO membrane can also change the taste of water and make it taste bitter and unnatural. Because of this post-RO activated carbon filter, taste enhancer or mineralizer cartridges are used. Know the Best Time to Change RO Membrane. So what we are trying to bring out here is, for reliable purification and pure water what is needed is a combination of multiple purification technologies. We would not like to unnecessarily stretch this post long and would like to end with our final thoughts with this. It is not advisable to rely on any single purification technology as every purification technology has its pros and cons. What is needed is a multi-stage purification approach that uses multiple purification methods. That is why we recommend water purifiers which feature a combination of RO, UV, UF with TDS controller/modulator or Mineralizer. These water purifiers are suitable for most Indian homes. Hope you found this detailed explanation, of difference Between RO, UV, UF and MF water purifiers, useful. Reverse osmosis water filtration systems have become very prominent in a manner that it has become synonymous with water purifier systems. Many people fail to realize that Ro system is a type of water purifier and they are of the common misconception that all water purifier is basically equipped with Ro purifier technology. So if a water purifier has an ultraviolet filter with mineralizer. Is it good enough or there should be ultrafiltration at the end? Mineralizer or TDS controller is required in RO purifiers only. Non-RO purifiers do not require mineralizer. If the TDS level of the incoming water is low and the water does not contain heavy metals like lead, arsenic etc., then you can choose a UV + UF water purifier.